While Kampot is generally known as a pleasantly sleepy town, popular for its happy pizza-seeking backpacker scene, it offers much more for those who are a bit more adventurous. 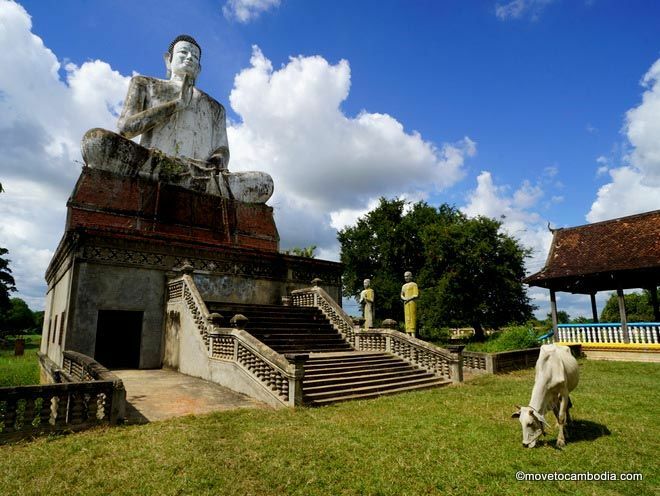 You can drive a scooter on the long and winding road up Bokor Mountain, kayak around the Green Cathedral loop in the Preak Teuk Chhu river, or venture out to the salt flats or visit the famous pepper farms and salt flats. Or, you can climb and spelunk over, around, and through the caves of Phnom Kbal Romeas. Climbing Kampot…for when sitting by the river just isn’t enough. 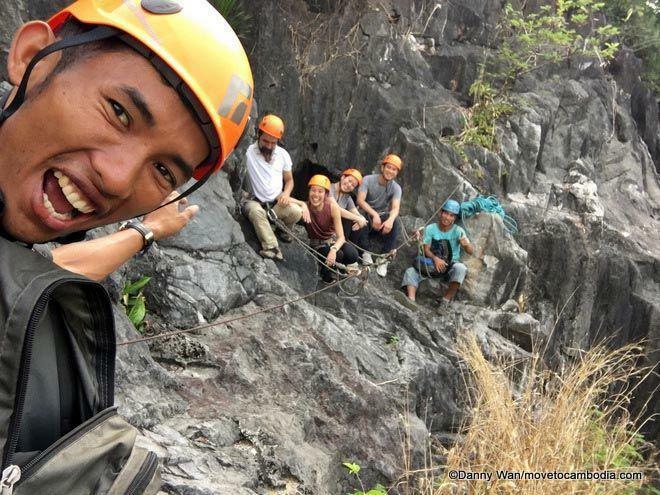 While it’s possible to visit the site on your own, we signed up with Kampot-based adventure company Climbodia, which offers half-day tours for everyone from novices to experienced climbers. 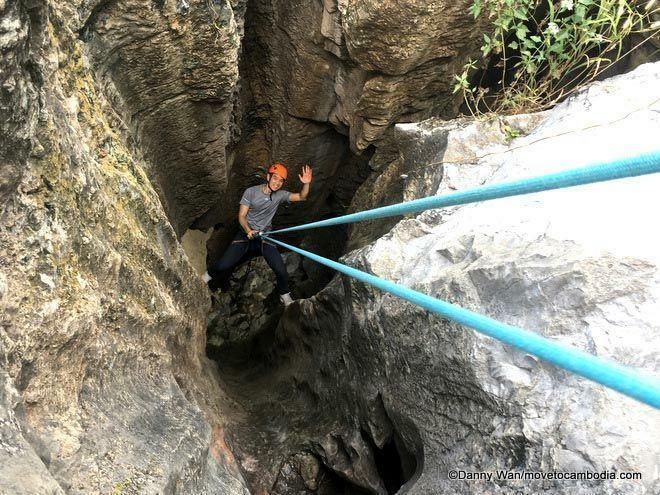 We opted for their best-selling Discovery Tour, which includes a variety of activities, including via ferrata, abseiling, caving, and top rope climbing. It turned out to be a great choice for beginners who want to explore the mountain while getting to sample a variety of climbing activities. On the morning of our tour we rented a motorbike and made the dusty trek east on National Route 33, following Climbodia’s directions. It was a good 20- or 30-minute ride from the Durian roundabout in Kampot on bumpy dirt roads. After leaving the main road and riding into the countryside for a few kilometers, we arrived and were rewarded with a beautiful view of the limestone mountain. Our local guides met us at the base of the site and provided helmets and climbing gear, which were in pristine condition. The guides were professional and stressed the importance of safety. They made us feel just as secure out in the middle of the Cambodian countryside as we do in the protected environment of our local indoor climbing gym at home. There were only four of us on the tour, and so we each received a lot of attention from the guides. The first activity was a gentle climb up an ungraded route, which was more like scrambling than actual rock climbing. Despite the ease of this climb, the temperature and humidity ensured that all of us were sweating by the time we made it up. Thankfully, the tour started early enough that the sun had not yet reached our side of the mountain. After we all made it up, we were rewarded with a sweeping view of Kampot. Our guide pointed out some interesting sites in the distance, such as the newly operational railroad and the Buddhist temple where monks had taught him English. Their training clearly paid off, since he had loads of fun joking around with us. Rather than letting us risk damage to our phones, our guides carried them and offered to help us take pictures “for the Facebooks and Instagram.” After a brief photo op/water break, we clipped our harnesses into steel cables and began the first via ferrata section of the tour. Clipping in and out of the cable, we clambered over jagged rocks and cautiously made our way along the ridges of the mountain. Though we had no prior via ferrata experience, the path felt very doable and required only minor effort. The Climbodia guides are professional…and fun! We eventually stopped at a flatter area where two narrow openings led into the mountain. Peering in, we could see all the way to the bottom of a steep drop, where one of the guides was waiting for us. Another guide gave us a very brief tutorial–basically, he slid down the rope really quickly–and then they tied a rope in for us and we were told to abseil down ourselves. It took some courage to take that first step, but abseiling turned out to be exhilarating and not difficult at all. We slid down one after the other and found ourselves at the entrance of the cave. The caving portion of the tour then began, after each of us was equipped a headlamp. Entering the cave, we were greeted by a small arrangement of bricks, all that remained of a great temple that once stood there. Like many places in Cambodia, it had been destroyed by the Khmer Rouge, even though it was hundreds of years older than Angkor Wat. 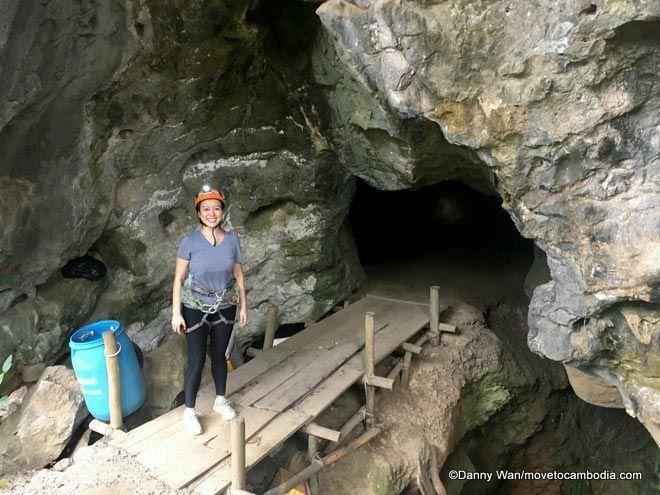 Your adventurous author Danny, caving his way through Kampot. As we journeyed deeper into the mountain, the floor was wet and slippery, but even standard gym shoes provided sufficient traction. It was also chilly, in contrast to the sweltering heat outside. Some members of our party suffered from claustrophobia, but the cave was actually fairly open. Most of the fully enclosed sections were short enough that we could always see an exit or a glimmer of light. The most challenging part involved crawling on our hands and knees for a meter or two. Our guides pointed out rocks shaped like animals and a place where stalactites and stalagmites had grown together. How many thousands of years had it taken for these to form? Though we spent close to an hour exploring narrow passageways, we were keenly aware that the paths went much deeper and that there were many more parts of the cave to explore. Next came the final via ferrata portion of the tour. Cables led us out of the cave and the temperature quickly rose as we made our way back into sunlight. Once we reached the end of the cables we were led around the mountain and back to where we’d started, to do some rock climbing. 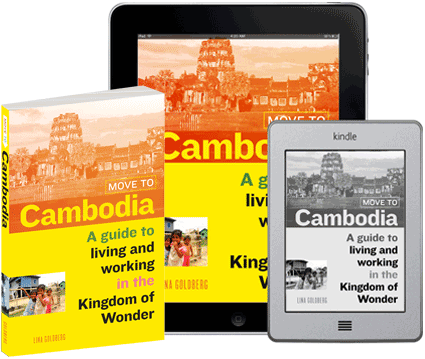 Move to Cambodia researcher and intrepid explorer, Shirley. Climbing shoes were not required, but could be rented if desired. Other groups of people who had rented gear from Climbodia were also there, climbing on their own. There are about a dozen climbing routes, from beginner to advanced levels, with the highest going up some 30 meters. Compared to indoor climbing, these routes required a bit more creativity. Our guides were very helpful and showed us how to navigate whenever we got stuck. Although there was plenty of joking and banter, they belayed us and I felt safe. As beginners, we were happy with their support. Each of us managed to climb three or four routes before deciding that we were completely exhausted and it was time to go relax in a hammock. 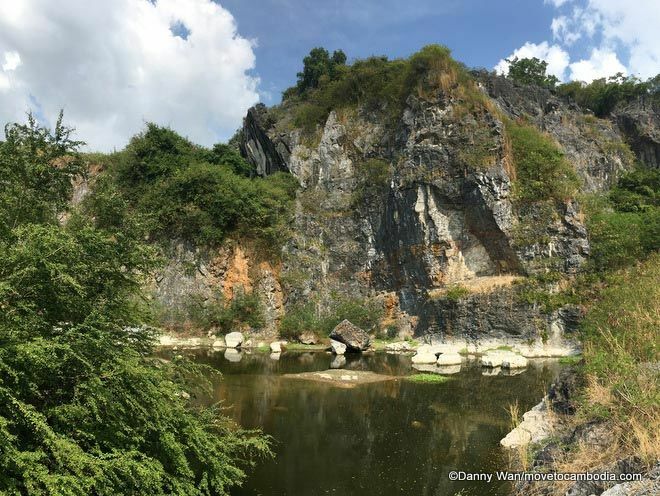 We’d had a very satisfying experience in an incredibly beautiful place, and Climbodia’s Discovery Tour was a perfect way to see a less sleepy, more thrilling side of Kampot. Danny Wan briefly lived in Phnom Penh, but still loves coming back to visit (and he paid for his own tour…this is an entirely honest review). 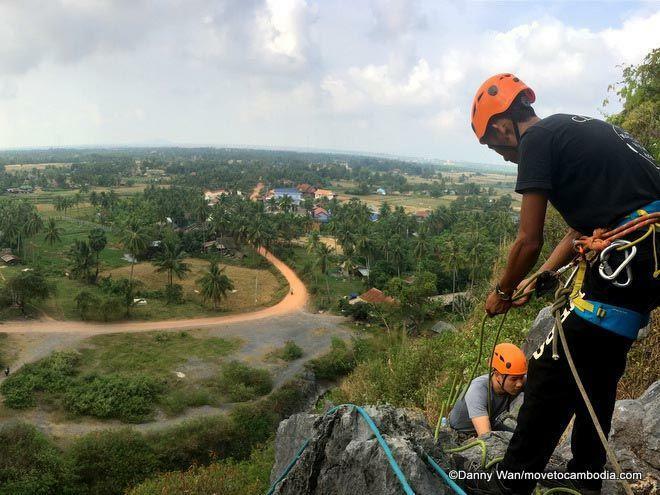 This entry was posted in Kampot and tagged Climbodia, climbing. Bookmark the permalink.